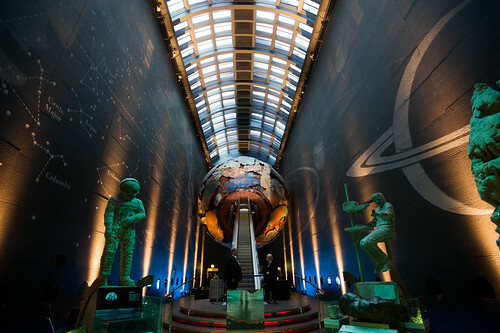 On our itinerary, we put down 2 London attractions to visit as a single activity -- the London Museum of Natural History and the London Museum of Science. As a family we are not sure which we will do and it is highly dependent on the day. Though both have activities for the entire family, the science museum lends itself to our older kids and the natural history museum to the younger ones. We will decide who is most restless and start in the appropriate museum. The afternoon seems to be a poor choice of time to attend. Lines can be long even in March. Though it appears to be worst on the weekends, standing outside in the rain waiting to get in is never a good prospect. A tip for visiting the London Natural History Museum is to use the side door that tends to have shorter lines. 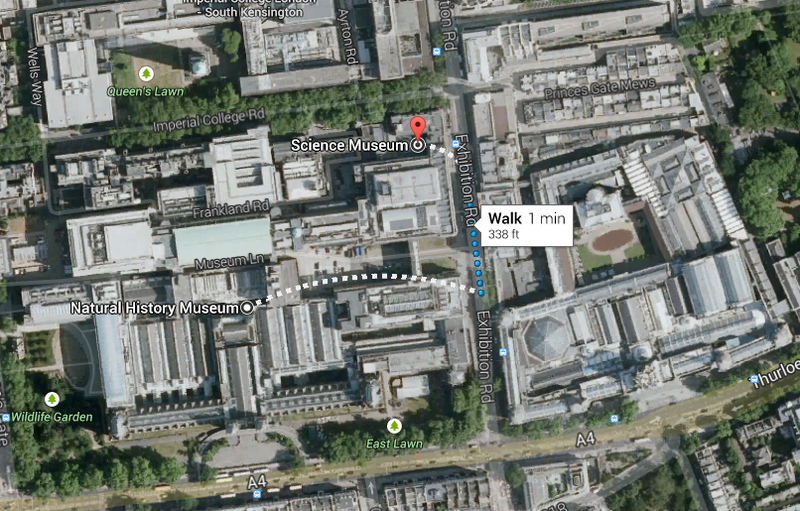 Conveniently located on Exhibition Road, it is right next to the main entrance of the Science Museum. The price to visit museum is free, though there are some temporary exhibits that may cost. You can simply make a donation; they are happy to take your money. In reading reviews some people felt pressured to buy a museum guide, for a £1 donation. I don’t think that will be a problem for us. When in doubt we can print the map below. The London Pass does not buy us anything special for this attraction. The highlight of the Natural History Museum appears to be the dinosaurs. You can see them at ground level or a high level walk. Check to see how busy the high walk is before heading up to that level. It is narrow and hard to pass people. The museum is color coded by zones. The dinosaurs are in the blue zone. The red zone of the museum is about the forces of the earth: volcanoes, earthquakes, geology, etc. The green zone is about minerals, birds, fossils and creepy crawlies. You can enter a life sized termite mound or go head to head against an interactive arachnid. The orange zone is dedicated to Darwin; it includes the Wildlife Garden which is open from April through October. Another big draw is the architecture is self. The building opened in 1881 and is designed in the Romanesque style. It looks like a cross between a large church and a palace -- lots of arched ceilings and buttresses. It makes for a caverness feeling in the main hall. Each zone has its own bathroom, for the most part on the ground level. They do have WiFi in the museum that you can use. Make sure that your phone is set correctly. The nearest London Tube station is South Kensington which is served by the District, Piccadilly, and Circle Lines. We will be walking from Harrods about a 1/2 mile down the road, so we will not be using London Transport option. There is always the option of riding a bike. The bike dock for Barclays Cycle Hire is just outside of the Exhibition Road entrance. You can also use the bike dock on the other side of the museum, on Queen's Gate Rd, and stop to take a picture with the statue of Lord Baden-Powell, the father of the scouting movement. Going on a family vacation builds memories, provides life changing experiences and helps teach about the world we live in. Take time to explore, enjoy and have fun. 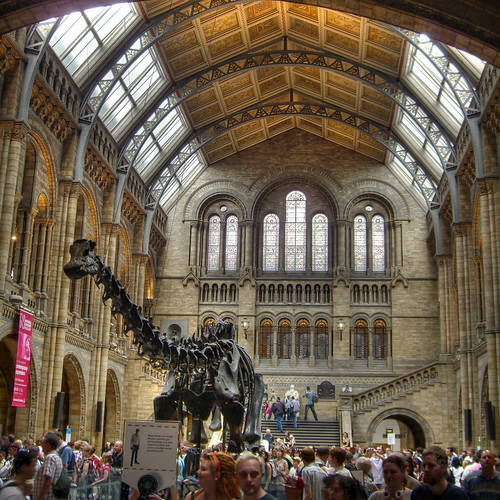 If the London Natural History Museum sounded interesting you may also like the British Museum. You can also look at our entire list of London Attractions.